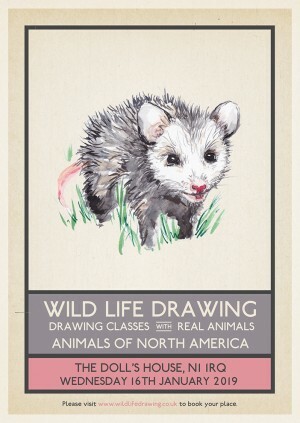 In the new year we look to animals of North America for our inspiration – meeting and drawing species including an opossum, skunks, polecats and two charming prairie dogs. Each of these animals has evolved to suit the environment and to thrive alongside urbanisation – with some of these animals considered pests in the cities. We will be discussing the characteristics, habits and diets of these animals and look at the welfare issues affecting their species. In particular we will talk about the endangered wild population of American Polecats (AKA Black Footed Ferrets) and the incredible efforts of a conservation breeding program aiming to reintroduce animals into the wild to sustain the population. The drawing class is open to all, from beginners to advanced. All drawing materials are supplied, including paper, but please feel free to bring colours or any other specific media you might like to use. Drawing tips and guidance will be provided throughout the session. The aim of these drawing classes is to inspire a sense of appreciation and understanding for the animals and their conservation in the wider world. Wild Life Drawing is working with the finest animal handlers, sanctuaries and organisations to put on these events. All the animals that attend the sessions are well used to humans and comfortable in different environments, their welfare is our highest priority. These animals will be attending with two highly experienced animal handlers that not only care for these animals but also re-home other unwanted exotic pets or rescue animals. These animals will be in specially designed runs, with plenty of enrichment activities and hidden treats to keep them occupied and happy for the time they are with us, whilst mirroring their natural behavior. All animals go through a 'Heath and Happiness' test before attending any external events, and are rewarded with their favourite foods.